Winch Line | Synthetic Winch Rope | MP Classic 5/16"
The 5/16" winch line works best with winches ranging from 6,000 - 8,000 lbs. For more information on what length/diameter to choose please reference our Winch Line Guide. Back in late 90’s, Master Pull started experimenting with installing synthetic winch lines on recreational off road vehicles. At the time, off roaders had never seen anything like it. We told them that synthetic ropes were lighter, stronger and safer than steel wire rope. Most people told us we were crazy. It took some time, but people finally realized the benefits that synthetic rope had over steel wire. Ever since we have strived to offer the highest quality synthetic winch lines available. The Classic Winch Line is an ode to the original winch line that Master Pull started selling over 15 years ago, but with a modern twist. We’ve taken all the enhancements over the years and encompassed them all into the Classic: heavy duty thimble, lightweight hook, universal drum attachment, detachable Rock Guard, high visibility heat guard - all these things make the Classic the best bang for your buck winch line available. The best part is, the Classic Winch Line is hand spliced here in the USA, when you order it. There’s no inferior imitation materials used here. Master Pull quality at an affordable price. 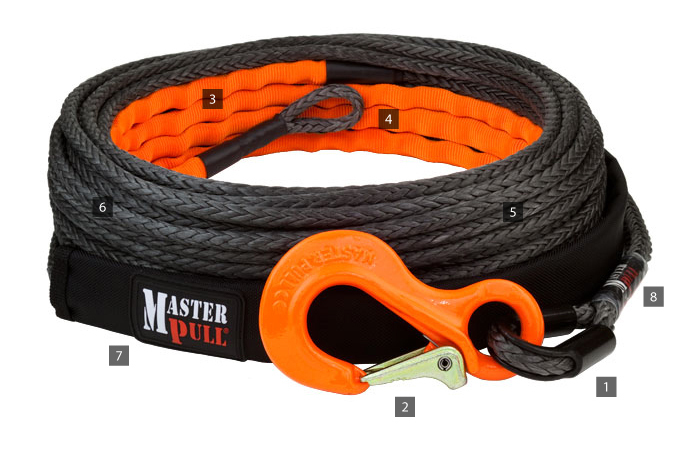 The Master Pull Classic Winch Line was designed to be extremely lightweight and tough. We use heavy duty tube thimbles in the eyes for ultimate protection. The optional hooks are specially designed for use with synthetic rope to be both strong and lightweight. On the drum end, the line is covered with a heat resistant sleeve to both protect from winch brake heat and drum abrasion. The bright orange color also helps signal that the line is on the last wrap of the drum. The universal drum attachment includes hardware compatible with most winches. For additional abrasion protection, the Classic includes our removable Rock Guard. This chafe guard can be velcroed on the line if it has to run over rocks or trees to protect it from damage. The Classic Winch Line is made in the USA out of genuine Dyneema SK75 synthetic fiber, which has many benefits over steel wire rope. The Classic Winch Line is so light, that in the event of breakage it will not violently snap back like steel wire rope will, making it much safer. The reduced weight also allows for easier use than steel wire, and the soft fiber will not cut hands with splinters or burrs. On top of all these benefits, size for size, the Classic Winch Line is stronger than the steel wire counterpart. Despite all the benefits that the Classic Winch Line has over steel wire rope, the proper precautions must be taken when using synthetic rope for winching. Synthetic winch lines are more prone to chafe damage than wire rope, so ensure that the winch rope is rigged properly and isn’t rubbing on rocks, trees or other abrasive surfaces while under tension. This is why we developed our removable Rock Guard to protect the rope when you can’t avoid contact with abrasive surfaces. With proper use and care, the Classic Winch Line will last just as long, if not longer than a steel wire rope. For more information on maintenance, visit our Synthetic Rope Maintenance page. Click the button below to add the 8mm (5/16") Classic Winch Line - 12,300 lbs to your wish list. I installed it to my winch yesterday. 10xs better feel than the old cable that the winch came with. Not worrying about the cuts I use to get from the Steele cable and can't wait to put it to use. The hook itself is 2 times the size as the hook that came with the original cable and it's lighter. I can't wait to put it into use and it looks great. Great Product..